In 1987, Firebird Software released Pete Cooke's Brainstorm to much critical acclaim. It's a very simple puzzle game where you control 3 moving lines to trap the ball in the red zones to increase your target score in order to progress to the next level. PLAYING THE GAME ---------------- Brainstorm is played over 26 screens, each presenting different problems for trapping the ball. The lines which are used to trap the ball(s) can be selected by moving the pointer to one of the Cyan, Yellow or White bars of the control panel on the right and pressing fire. Once selected the bar will pulsate. Now move the pointer onto the playing area and press fire. The line you have selected will move across the grid to the position of the pointer. Each screen is played against a time limit, shown by the timer in the right hand panel. In order to complete a screen successfully your present finishing score must be greater than your score on finishing the previous screen. 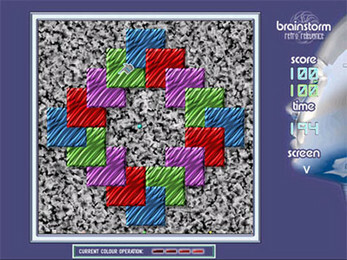 The screen displays two scores:- the top is your score upon finishing the previous screen, the one below is your present score. If your present score is better than the last it will show on red, otherwise it will be on magenta. If your score goes below zero or you fail to turn the second score red before the time runs out then the game will end. The Grid: BLACK and BLUE have no effect as the ball passes over them, RED increases your score; MAGENTA loses you points and GREEN will cause your ball to jump randomly to another part of the grid. Mouse to move pointer, left button to set line destination, right button to change line colour.